Welcome to the Big Brands Sale X-Mas edition! Hey guys! Wanna score some nice finds in time for the Yuletide Season? 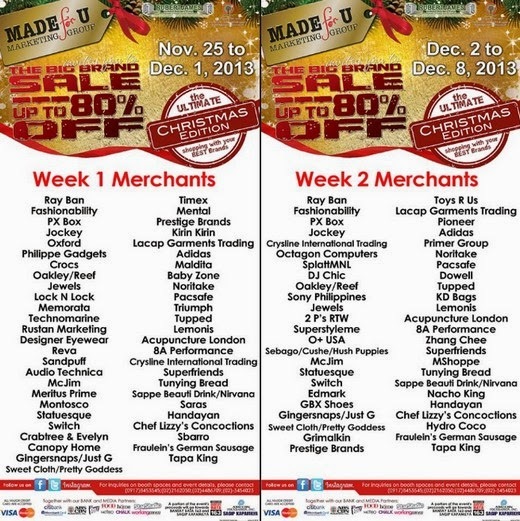 You're in the right place because the Made for You Marketing Group would like to invite everyone to the BIG BRAND SALE – CHRISTMAS EDITION which will be held at the Pinoy Big Brother Concert Hall from November 25 – December 8, 2013. This one of a kind event features some of the biggest brands selling their top notch products at insanely low prices. The Big Brand Sale also features our local ABS CBN talents selling their personal items to raise fund for Sagip Kapamilya. This is the perfect chance for everyone to take advantage of huge discounts, as you can get up to 80% off on selected items! Now, in lieu of the recent events facing our country, aside from the company’s commitment to donate part of the proceeds to Bantay Bata 163, we have also committed to help Sagip Kapamilya in assisting our kababayan’s affected by Super Typhoon Yolanda. In addition part of the Php 50.00 admission fee will be donated to both Bantay Bata 163 and Sagip Kapamilya. Gates open from 10:00am to 10:00pm from Monday – Sunday, November 25 – December 8. Shop and save lives, only at the BIG BRAND SALE. For contact details, please don’t hesitate to reach us at (02) 448 6709.